The Panduit ERT2M-C20 elastomeric cable tie is made of flexible elastic material to provide a flexible tie body that safely contours around cable bundles to prevent over-tensioning of data cables to maintain network integrity. The UL-94V-0 material provides greater flame resistance and meets stringent telecommunication flammability requirements, such as the NEBS GR-63-CORE. 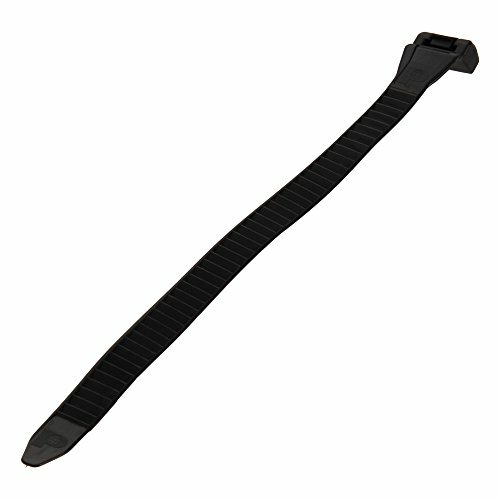 The cable tie has greater resistance to damage caused by ultraviolet light, making it perfect for indoor or outdoor use. The soft material has no shard edges to protect the installer and cable bundle for improved jobsite safety and reliability. A high coefficient of friction material provides a tight grip and prevents lateral movement along the cable bundle, minimizing overall installation time and potential re-work. Best of all, the releasable design allows you to release and re-use to accommodate frequent moves, adds, and changes to support evolving equipment and cabling needs. Panduit has been providing innovative solutions for over 55 years. In 1955 they launched their first product, the Panduct Wiring Duct, a new invention that uniquely organized control panel wiring and allowed new wires to be added quickly and neatly. Since that time Panduit has introduced thousands of problem solving new products and remained committed to providing innovative electrical and network infrastructure solutions. Today, customers look to Panduit as a trusted advisor who works with them to address their most critical business challenges within their Data Center, Enterprise, and Industrial environments. Their proven reputation for quality and technology leadership coupled with a robust ecosystem of partners across the world enables Panduit to deliver comprehensive solutions that unify the physical infrastructure to help our customers achieve operational and financial goals.